The first CD in Leo Records catalogue by the stalwarts of the Swiss new music scene: Jurg Solothurnmann - soprano and alto sax, Franziska Baumann - voice, Christoph Baumann - piano. 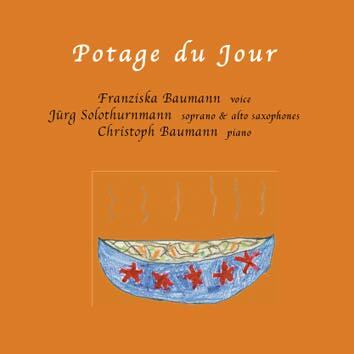 The trio Potage du Jour was formed in 1999 after an exciting improvised session.Since then nobody can predict what the ingredients of their next soup will be when they start cooking. Their recipe is constantly changing and depends on their experiences in other "kitchens" such as modern classical music, jazz, salsa, film & theatre music, live-electronics and music performance. At every performance they strive for a coherent musical statement. Call it instant composing.